Retail banks in Hong Kong are capitalising on fintech to innovate their product palate and to reach out to new customers through dedicated digital channels. As the gravity of global economic growth shifts toward Asia, Hong Kong is well-placed to remain the primary financial gateway into the evolving Chinese market. The innovations of financial technologies (fintechs) lend itself to the potential for Hong Kong to transform itself into the fintech leader in the Asia Pacific region. 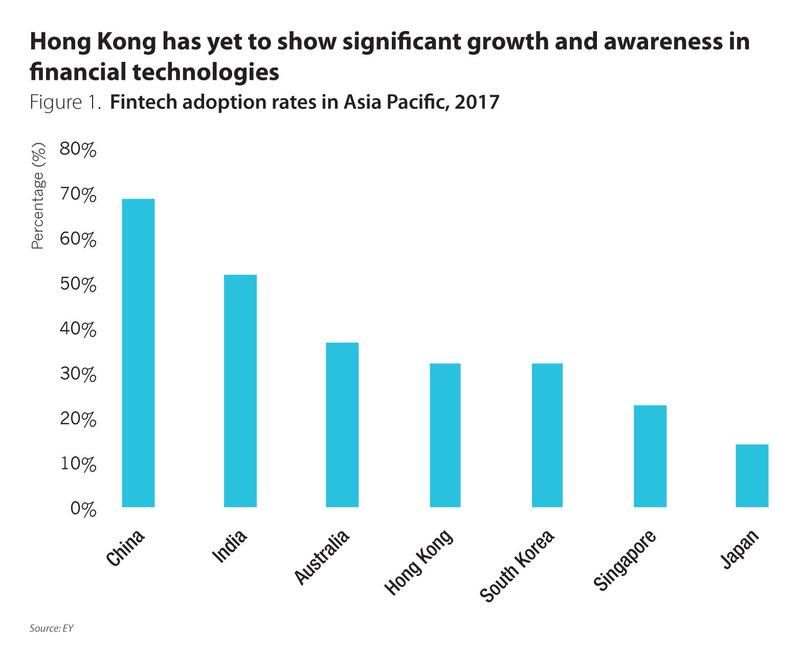 However, adoption rate of fintechs in Hong Kong is 32%, much lower compared to other APAC countries (Figure 1). Hong Kong is yet to show significant growth and awareness in fintechs categories. Competition from the mainland combined with subdued global demand has meant that domestic banks have struggled in recent years in the retail banking sector. Banks like Standard Chartered Bank Hong Kong and the Bank of East Asia now have dedicated digital banking strategies as they react to the digitalisation of the retail banking sector, a rapidly growing market that drives innovation and inclusivity. As banks from the China such as Bank of China, ICBC, and China Construction Bank penetrate deeper into the Hong Kong market, Hong Kong’s status as the primary financial hub is under threat. The seamless process and flexibility offered by new market entrants like online-only banks such as please name those players are stealing market share and customers from the established players. As a fintech ecosystem is taking shape in Hong Kong banks like Standard Chartered Bank (SCB) and Bank of East Asia (BEA) actively apply fintech to enhance, and in some cases, aim to transform the way they approach retail banking offerings to their customers. This report examines how Standard Chartered Bank and the Bank of East Asia are committed to improving their processes through innovation of their retail banking channels and products, and targeted approaches to attract a new generation of consumers. 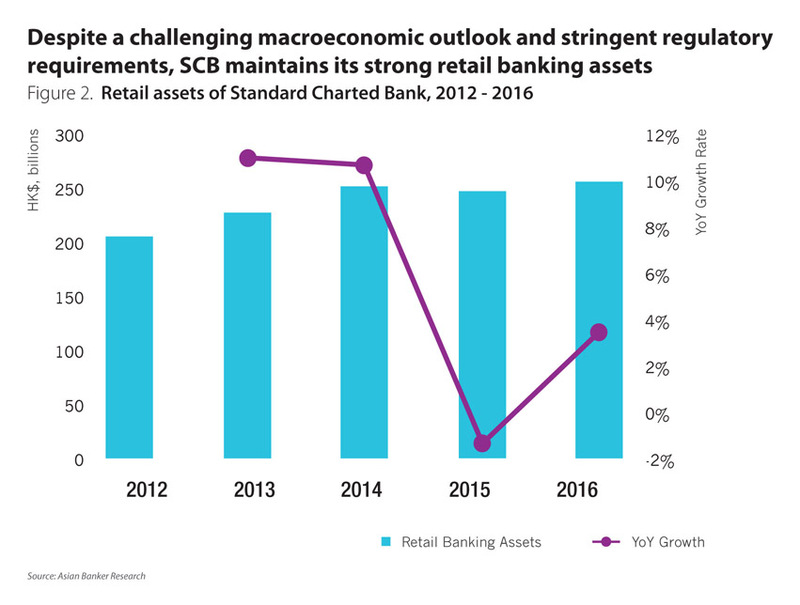 SCB is one of the top 4 retail banks in Hong Kong. At the end of 2016, its retail banking asset was $32.9 billion (HK$256 billion), a 3.6% increase year-on-year (YoY), and retail banking deposits were $48.1 billion (HK$374.3 billion), a 5.1% increase YoY (Figure 2). In a clear sign of the challenges the retail sector is facing, growth fell significantly in 2015. However, the bank’s retail banking revenue and profit both recorded a healthy growth of 4.1% and 4.6% respectively last year, demonstrating SCB’s resilience and strong fundamentals. The bank had a strong mortgage year in 2016. Acting on its focus to provide superior service, SCB opened weekend mortgage centres providing real-time consultancy for home buyers. In 2017 the bank will be exploring the digitisation of its application process, and introducing a bar-coding system to ensure a more efficient file flow in the approval process. Last year the bank enhanced its “Mortgage Saver” product with rebates in the form of Asia Miles, in addition to the product’s existing cash rebates. This move was aimed to target priority banking customers, niche customer segments that were more responsive to Asia Miles. Before the launch of Asia Miles-related mortgages, 46% of new mortgage customers were in this segment. But following the launch mortgage penetration of priority banking customers increased to 55% by September 2016, and 69% of new mortgage customers who opted for Asia Mileages became priority banking customers. Digital sales as a contribution to total sales increased strongly, with more than 60% of all credit cards sourced online and around 35% of all new customers coming from digital channels. But SCB recognises that it still has room to improve in its online application processes and customer experience, acknowledging that customers still have to take too many clicks and go through too many pages to apply for a credit card online. Incorporating new digital banking solutions to its processes, the bank designed a ‘workbench platform’ in 2016 for employees in the form of a wireless tablet installed with its own banking solutions software; it offers real-time connectivity and semi-STP for a selection of products. More time is still needed to see how the bank adapts its practices around this device, and how much of a substantive business impact it will have. SCB introduced a new video banking platform in 2016 that was launched in several regions, including Hong Kong. With video banking as part of its service offerings, customers can speak to banking consultants over a secure video connection from anywhere with just a laptop. This new channel allows customers to do almost anything they could do in a branch, from signing up for a new card to finding a mortgage. By 2018, SCB hopes to reduce paper-based on-boarding and turn-around times, increase online sales and transition away from reliance on brick and mortar branch transactions. In the field of mobile banking, SCB has long-term aims to vastly improve its app and software integration, and roll-out better product offerings to customers. By the end of this year it will have fully integrated its internet banking and mobile banking platforms, and on-boarded Apple Pay, Android, and Samsung Pay to better serve a wider range of customers. SCB has already seen a significant increase in the retail spending of its digital wallet users of around 13%, with 100,000 cards registered in its mobile wallet program by the end of 2016. SCB launched the Octopus O! ePay to compliment the Octopus e-payment card common throughout HK. It pioneers peer-to-peer mobile payment in Hong Kong and facilitates instant top-up of physical Octopus cards via mobile. While user adoption is currently limited to Octopus users, the bank wants to roll out a full peer-to-peer open platform in August 2017. In April 2016, SCB was the first bank in Hong Kong to offer biometric log-in for mobile banking. The bank achieved strong digital penetration with around 10% growth in registered internet banking users, 20% growth in registered mobile banking users and acquired more than 100,000 active mobile wallet users. It is committed in retail banking technology with investments of more than 10% of overall retail bank profit, and supporting eXellrator, its fintech innovation lab. Looking ahead, SCB (Hong Kong) will continue to innovate in the digital space and deepen its customer relationship; the bank places strong emphasis on superior customer service as a differentiating factor in the future financial environment. BEA is Hong Kong's largest independent local bank, with consolidated assets of HK$765.7 billion as of 31st December 2016. BEA maintains one of the largest retail branch networks in Hong Kong, with 78 full-service branches, 55 Supreme Gold centres for high net-worth customers, and ten i-financial centres throughout the city. BEA is largely a retail bank in Hong Kong with retail deposits contributing over 54% to total deposits, and retail operating profits contributing as much as 40% to total profit. The bank clearly benefitted from the objectives it set at the start of the year, which included strengthening oversight over credit quality and implementing strict cost controls. In 2016, the first year of its three-year cost reduction campaign, the bank achieved 40% of its three-year goals. Concurrently, the bank announced its commitment to digitalisation to prepare itself for a digital banking future. In line with its vision for a digital banking future in Hong Kong, BEA is overseeing a project to digitise its branch model throughout its network of Hong Kong branches. As of December 2016, 53 branches have been upgraded to the digital model and an increased take-up of new accounts from targeted segments has been seen at transformed branches. The bank expects that it will complete the transformation for its 150 year anniversary in digital banking including mobile banking platform to incorporate stock trading and credit-card services and personal loan services. Collectively, the bank recorded a 15% rise in major all-in-one accounts like SupremeGold, Supreme, and CorporatePlus accounts, resulting in an 8.7% increase YoY in average daily retail current and savings account balances. With the expansion of its digital ecosystem and platforms, staffs are able to spend more time effectively interacting with customers on issues like financial management, product information, and generally improving customer experience with the bank. This reflected as a 12.4% and 16% YoY increase in commission income from investment and insurance products respectively for year 2016 while the industry growth in this field was 6% (Figure 3). Aside from the through transformation of its branch networks, Bank of East Asia unveiled several digital banking initiatives that complement its plan for digital banking. In February 2016 BEA opened its first innovation centre in Kwun Tong, designed to allow digital specialists to interact and share big data ideas and insight. Enabling guests to interact with the bank’s latest digital innovations and services, the bank is banking on creating a “brand experience” to demonstrate BEA’s commitment to innovate the future retail banking experience. Later in November 2016 BEA announced Touch ID authentication service for its BEA mobile banking app, introducing biometric security to enable customers to access frequently used functions on the app quickly and securely. Such enhancements enrich the user experience of mobile banking apps and signal the bank’s eagerness to adopt fintech solutions into its processes. Finally in January 2017, BEA rolled out its “iPortfolio Analyser” mobile software equipped with banking solutions for its relationship managers. Eliminating the traditional confines of a brick and mortar branch, this app allows mangers to access and display the latest account financial information on an iPad during client meetings anywhere. The app allows for flexibility and timely investment decisions that has benefitted both customers and staff, who have found the app invaluable in crafting customised investment options. Looking ahead to 2017, the bank aims to also expand its mobile banking platform and incorporating a host of new features, which include: stock trading, enhanced credit-card services and personal loan services. BEA hopes that with this convenience new customers will jump onto its mobile platform and improve its cross-selling ratio. Additional enhancements will provide a more seamless integration of bank services and products to meet customer needs. In order to support this mobile and online banking digital expansion, the bank plans to invest in a comprehensive overhaul of its digital service infrastructure and upgrade underlying hardware and software. 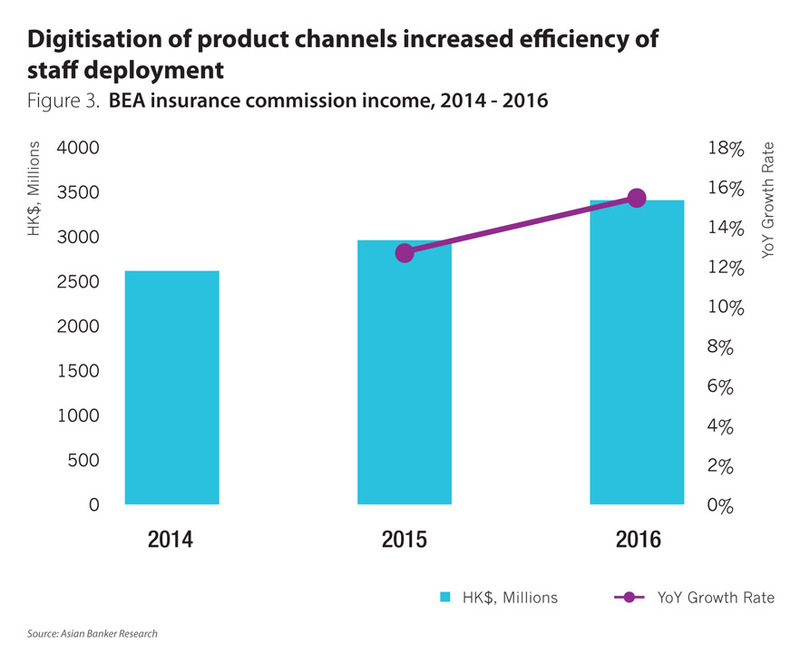 Macroeconomic headwinds and regulatory requirements are making retail banking more competitive, banks like BEA and SCB (Hong Kong) must focus their efforts on innovative business solutions that serve customers’ needs. Targeted approaches, like the SCB Asia Miles initiative, are case studies into how retail banks understand their consumers, its flexibility in enabling customers to earn miles directly through banking services such as deposits, investments, insurance, personal loan, and mortgages are exceptional in the current retail banking environment. Inclusivity, such as the open payment platform, pursued by SCB is also a positive step towards the future of digital banking, and consumers reacted positively to the banks’ approach. Banks in Hong Kong have the experience, talent pool, and capital to take on future challenges from mainland China and around the region to remain a financial hub. The development of fintech in the city will be primarily driven by the dominant financial institutions, keeping competition high and market forces strong in any economic situation.